Indian Contracts Act 1872 deals with the topic Promissory Estoppel. 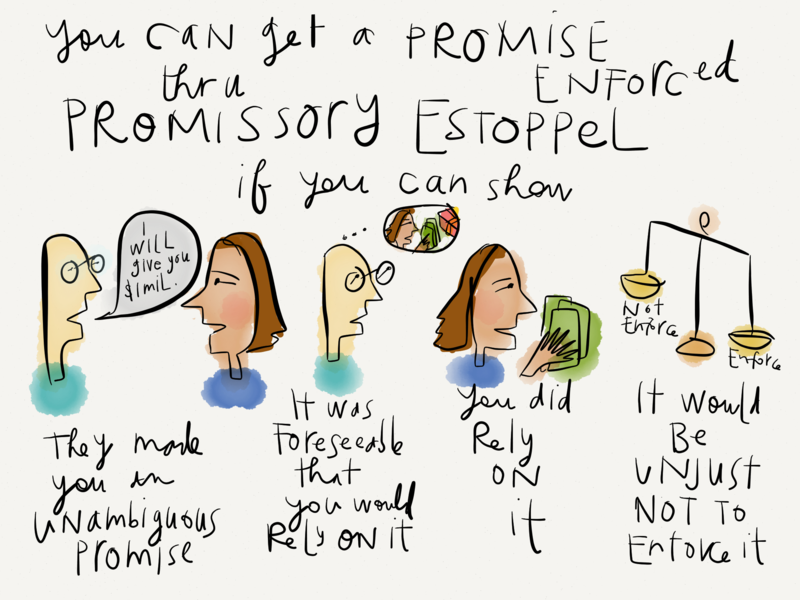 The whole ambit of promissory estoppel stands on the pedestal of “Promise” and “Enforcing it”. In the field of law, the doctrine of promissory estoppel is a departure from the doctrine of consideration. There is no provision as such which clears availability of relief under this principle but it is enforceable and based on equity, to protect the innocent party as a shield. The doctrine, its evolution, jurisprudence behind the principle has been dealt here. Various cases in which this principle is followed and these are precedents to assure the availability of this principle in Indian law are mentioned in this article. A promise in future creates an estoppel, the precept being that if a promise is made and it’d been acted upon, the party making the promise will now not be allowed to return out of it and the courts have to insist that the promise so made is venerated. The precept of promissory estoppel stated in India, therefore in which one by his phrases or demeanour made to the alternative party, a clean and unequivocal promise, who supposed that it would be acted upon through the party to whom the promise is made and it’s far in fact so acted upon by the opposite, the promise might be binding making it and he might be not entitled to go lower back upon it, if it’d be inequitable to allow him to achieve this having regard to the dealings that have taken region among the parties, and this would be so no matter whether or not there’s any pre-existing courting between the parties or no longer . Promissory estoppel differs fundamentally from conventional contract idea as it protects reliance, not deals. developed to prevent injustice, this doctrine renders a promise binding if the promisee has suffered a few detriments in reliance on the promise, even though detriment changed into now not required as attention, i.e., the reliance or detriment has now not been positioned or suffered ‘ at the request of promisor’. The precept of estoppel in India is a rule of proof integrated into sec 115 of The Indian Evidence Act, 1872. It’s miles an equitable doctrine. The doctrine has been variously known as ‘promissory estoppel’, ‘equitable estoppel’, ‘quasi-estoppel’ and ‘new estoppel’. The precept developed by means of fairness to keep away from injustice and even though normally named ‘promissory estoppel’, it’s far neither within the realm of contract nor inside the realm of estoppel. The real principle of promissory estoppel is wherein one has via his words or behaviour made to the alternative a clean and unequivocal promise. The alternative to whom the promise is made and it’s far in truth so acted upon by the other, the promise would be binding on the party making it and he might no longer be entitled to head returned upon it. It isn’t always essential if you want to attract the applicability of the doctrine of promissory estoppel that the promisee appearing in reliance on the promise, have to suffer any detriment/loses. The necessary is that the promisee needs to have altered his position in reliance on the promise. In India, the courts have taken the initiative to lay emphasis on equity and justice and feature explained the doctrine of promissory estoppel in India. That there has been a representation or promise in regard to something being executed in the future. That the representation or promise was meant to have an effect and is acted upon for this reason. The doctrine of promissory estoppel couldn’t be invoked through the promisee unless he had suffered detriment/loses. All this is required is that the party maintaining the estoppel ought to have acted upon the promise given to him. In India, the doctrine became marked by the two massive instances which can be: – Pre-Anglo-Afghan case and post- Anglo-Afghan case. Previous to this situation promissory estoppel did not follow in opposition to the government. In this example, the Supreme Court held that the authorities changed into estopped by means of its promise. Thereafter the courts have applied the doctrine of promissory estoppel even towards the authorities. The Doctrine of promissory estoppel cannot be invoked while the illustration or promise made with the aid of the government officials or public authority is past or is prohibited by means of law. In Gopi Chand Television v. Director Doordarshan Kendra, Hyderabad AIR 1995 AP 199 where the petitioner made the proposal to produce a serial for Doordarshan in thirteen episodes however subsequently he sought permission to produce the serial in 26 episodes, he became barred through estoppel. The plea of promissory estoppel isn’t always available towards the exercise of the legislative functions of the nation. The doctrine cannot be invoked for preventing the authorities from discharging its functions beneath the law. When the government acts outside the scope of his authority, the promissory estoppel won’t apply. The doctrine of ultra-vires will come into operation. While the officer acts inside the scope of his authority and promises expressly directed or indirectly indicated and the other person acts accordingly, then the courtroom is entitled to require the officer to act in line with the scheme and the settlement or representation. The authorities of India underneath Article 299 of the Constitution can enter into contracts. Article 300 describes what identify the government of India which needs to be sued. India, basically following legal device from British rule of law. However, the fundamental has come an extended way in India. The concept has advanced through incorporating American laws. The State is an identity and the parties have a remedy against it. The person was not given rights against the executive however after metamorphosis right is given against executive. The judiciary has adjudged the State as an identity and now it can’t declare immunity. It’s been said in no uncertain phrases that the country will be held accountable for its promises just as a personal citizen. In such instances, where the kingdom via its government makes guarantees to people. It is assumed by way of the courtroom that the promise made through an officer of the government is the State who had made the promise. Judiciary may ask the government to provide motives for its promise and if these reasons were for public desirable then the country may be excused for failing which it’s far dependable. The judiciary has gone and cleared the translation of Article 300 and set the State out to be a non-public citizen in preference to a public body or an organization. Lyle Meller vs. A Lewis & Co (Westminster). Pollock & Mulla, Dr RG Padia, “Indian Contracts and Specific Relief Acts”. Disclaimer: This document is intended to provide information only. If you are seeking advice on any matters relating to information on this website, you should contact us directly with your specific query or seek advice from qualified professionals only. We have taken all reasonable measures to ensure the quality, reliability, and accuracy of the information in this document. However, we may have made mistakes and we will not be responsible for any loss or damage of any kind arising because of the usage of this information. Further, upon discovery of any error or omissions, we may delete, add to, or amend information on this website without notice.